Ft. Lauderdale, FL-HOOKnSHOOT move beyond Indiana this weekend with a show in the Sunshine State to end their year in style and warmth. HOOKnSHOOT were heavily involved with Ring Of Fury in MA earlier this year but this is the first time they are hitting the road using their name, a move we can expect to see more of next year as they pursue sanctioning in NV and possibly WA. This year-end show is dominated by the American Top Team with a total of seven fighters including the incredible Dustin Denes fighting as a Middleweight, Hermes Franca defending his belt against Ryan Diaz, and both Southeastern title matches, a new concept for HOOKnSHOOT. The main one to watch would be Denes who has been tearing up the scene since his debut in DEEP 2001 and now holds the #3 rank in Shooto’s 83 kg division while his opponent Scott Henze is well known to fans of HOOKnSHOOT. In possibly one of the fastest paced fights of the night Franca, ranked #8 in Shooto’s 65 kg division, was last seen in HOOKnSHOOT where he took Anthony Hamlett’s belt three months ago and now faces the more experienced but less perfect record of Shooto and Super Brawl vet Ryan Diaz. Also Conan Silvera makes his return to MMA after being out of the ring for almost two and a half years since his loss to Dan Severn taking on Wes Sims, the Hammer House giant most likely to fill the shoes of Coleman and Randleman in the years to come. Also putting in a strong showing is AMC Pankration out of Seattle including the return to MMA of Matt Hume and the return to HOOKnSHOOT of Aaron Riley. Hume’s fight against the UCC’s Pain Peters is dripping with a “Heaven and Hell” theme with Hume being the soft spoken and polite devout Christian while Pain is known for his Tank Abbott like antics. Pain is coming off two straight losses in UCC this year while Hume is coming out of retirement after a whopping five and a half years off since his win over Pat Miletich all the way back in Extreme Fighting 4 so both of these fighters need this win badly. Riley is not only one of the most exciting fighters in the sport at 170 but unfortunately is best known for his losses with two to Yves Edwards and one to Robbie Lawler in his UFC debut earlier this year but don’t let that fool you-this guy is most likely candidate for fight of the night as he takes on Ruas Vale Tudo fighter and IVC vet Barros in what is definitely not a gimme fight to get his win column advancing. Both these fights are the most interesting from a story line perspective. The only thing that could have made this card better would be if the women’s 135 lb belt between Judy Neff and Angela Restad had not been cancelled. With Neff’s knee injury and not enough time for a replacement like Debi Purcell or Tara LaRosa to take her place the belt bout is off until some time next year, bringing a premature close to the breakthrough year of women in MMA started with HOOKnSHOOT “Revolution” in April. Tickets for this show are still available. The War Memorial Auditorium is located at 800 NE 8th Street. Get your tickets fast for what is bound to be one of HOOKnSHOOT’s best cards of the year. 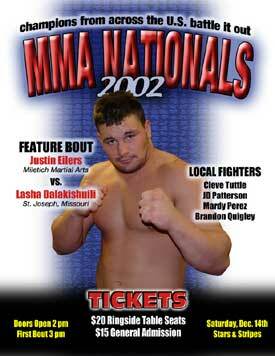 DAVENPORT, Iowa — Justin Eilers, the leading tackler on last year’s Iowa State University football team, will continue his mixed martial arts career Saturday when he competes in the feature event at the 2002 MMA Nationals. Eilers, 9-1, is coming off a decision loss to Dan Severn. His opponent will be Jeff Gerlick, 3-2. The MMA Nationals are scheduled for Stars & Stripes nightclub at 3 p.m. The event pits winners from the year’s Trial events against each other in five weight divisions. Winners in each division will receive pro contracts to fight in either Extreme Challenge or Super Brawl. At the 2002 Grapplers Quest World Championships on October 19th, an incident occurred which involved the disqualification of a Team Tiger Schulman’s Karate competitor, Mike Stine, who was involved in a match against a Team Marcello Mello competitor, Albert DeSilva. Referee, Francisco Neto due to a perceived slam from the knees, disqualified Mike Stein. A heated controversy immediately ensued in which the Marcello Mello camp demanded that the disqualification was appropriate, while the TSK camp maintained that an illegal slam didn’t take place and that DeSilva actually submitted. At this point, I approached the ring and attempted to calm the situation down. I immediately viewed the videotape and felt that, if anything, the slam was at best questionable; nevertheless, I was compelled to stand by my referee’s decision, as there were few other options available to me at the time. I was concerned that an “overtime” of the match could only fuel the situation. Subsequently, in the days following the event, I had carefully reviewed the videotape. It became abundantly clear to me that the Grapplers Quest “no slamming” rule needs clarification and modification. With a clearer explanation of the “no slamming” rule, the unfortunate disqualification of Team Tiger Schulman competitor, Mike Stine, would have been avoidable. Slamming has always been an extremely sensitive subject to me. I severely injured my neck (2 herniated disks) and back (2 crushed vertebrae and 2 herniated disks) in December of 2000 from a full slam at a tournament. After my injury, Grapplers Quest instituted a “no slamming” rule, but had no clear explanation as to what constituted an illegal slam (i.e. from knees, standing, jumping, etc.). It simply stated, no slamming at all. As children as well as adults attend our tournaments, we felt that it is of the outmost importance to protect, especially the children, from injury. As there was a lack of clarity in the slamming rules to begin with and as this was a questionable slam that resulted in a disqualification, we would like to publicly apologize to Team Tiger Schulman in general and Mike Stine in particular. We are now in the process of reviewing, updating, and clarifying all of our rules. We will pay special attention to what will constitute illegal or disqualifying techniques and we will put forth efforts to insure that all of our referees adhere to the same regulation and are constantly updated as to any changes. I want all teams to know that Grapplers Quest’s main purpose is to orchestrate the best events possible by creating a non-biased and safe tournament environment. If any competitor or team ever feels that they are being treated differently, I would ask them to contact me directly to resolve the situation immediately. We are looking to grow this sport and if we all work together, I know that we will. Ray and Monica Cooper once again wear the hat of promoters after a couple of Amateur Fighting Championship shows, which were tough man type of competitions with some modifications. They now turned their attention to their first MMA card. As they say, behind every strong man stands a strong woman and this is the case once again. Not only has Ray “Bradda” Cooper promoted his first official Shooto card, he also headlined it. Without the help of his very organized and detailed oriented wife, I am sure he would agree that all this would not be possible. The Coopers were contacted by the Shooto organization to start building amateur Shooto fighter in Hawaii. Since they are a fighting family and have fought in numerous events, they feel that the fighters come first and it showed in their first MMA event. Travel arrangements, great hotel accommodations, and a very professional venue welcomed Maui fans. Maui fans have already had a taste of MMA events and showed up in force for this event. The Coopers pulled out all the stops, including inviting Frank Shamrock to enjoy the night of fights, entrance lights, and ring ramp to give the Maui fans a taste of a big time show in a very small city. Takao wins by armbar from the mount at 3:25 min in the first round. Both fighters came out throwing some big punches in their first exchange. Takao circled and shot in for a double leg and took the fight to the ground. After a guard pass, Takao mounted his opponent in textbook fashion and controlled his position. After some punches to soften his opponent up, Takao finished Nguyen with an armbar from the mount. Takao showed impressive stand up and polished ground game in only his second fight. Keep your eyes on him. He may be the next great Hawaiian fighter, if promoters can find other 132 pound fighters to sharpen this diamond in the rough. Andres wins by unanimous decision after two rounds. After a win against up and comer Jim Kikuchi in a controversial stop, Andres returned to the ring to show his skills. Both fighters traded blows from the start with Corlione getting the better of the stand up in the beginning. Corlione took Andres down, but did not advance his position. After a scramble, Andres recovered his feet and took down Corlione twice and punished him with vicious leg kicks while Corlione was on his back in the open guard. The second round almost mirrored the first with Andres taking down Corlione and controlling his opponent from inside the guard and scoring enough to win the unanimous decision. I’ll end it here and skip the Godfather references. I do not want to go against the family. Ok, it slipped. Rodriguez wins by knock out at 0:12 seconds in the second round with a left kick to the head of Armstrong. Armstrong who was very impressive in his last fight in Warriors Quest took on local kickboxing powerhouse Tony “the Tiger” Rodriguez who is know for his aggression and hard hitting style while kickboxing. Rodriguez made his MMA debut in this fight and Armstrong seemed to have a good strategy against the kickboxer. Armstrong took Rodriguez down with a double leg and ended up in Rodriguez’s guard, but did not utilize this advantageous position and only sparingly hit the Tiger. Rodriguez on the other hand was busy from the bottom with a lot of punches, but could not generate much power from the bottom position. Round two ended quickly. As Armstrong set up another take down, Rodriguez threw out a blindingly fast left roundhouse head kick that put Armstrong in never-never land. Armstrong never went down, but his corner wisely saw that the cash register was empty and stopped the fight. Padilla wins by doctor’s stop after round one over Matsumoto due to excessive swelling of Matsumoto’s eye. Padilla took down Matsumoto early in the bout and just held his position. Matsumoto jumped at this stagnant opportunity to go for a knee bar which he locked and obtained a catch for both a knee bar and a toe hold. Padilla defended the numerous leg attempts very calmly and threw some heavy blows which caused some excessive swelling in the eye of Matsumoto as the round ended. After round one ended, the ringside doctor halted the fight and David Padilla was declared the winner by TKO. Coloma-Naho’oikaika by referee stop because of punches from the back mount at 3:51 minutes in round one. Coloma took down Taylor after both fighters exchange of kicks and knees from the clinch. Coloma, an experienced Jiu-Jitsu competitor, controlled the ground game and after an attempted mount, ended up on the back of Taylor and starts to deliver punishment and gets a deep rear naked choke in. Taylor defended and his mouthpiece fell out of his mouth. Taylor, while still being choked, puts in his own mouthpiece and continues to fight. After giving up on the choke, Tyson puts some leather to the head of Sean Taylor and causes referee Haru Shimanishi to stop the fight at 3:51 minutes in the first round. Paling wins by kimura (reverse key lock) while triangling Ackerman late in round one. Bozo starts this match with a takedown after obtaining a body lock and rains his usual big blows from the guard. Paling let Ackerman stand to deliver more punishment, but Ackerman takes Paling down and passed his guard. Paling recovered full guard and slapped a triangle on Ackerman. Since Ackerman was protecting his arm from going across his body, Paling switched to a kimura (reverse key lock) while holding his triangle to finish Ackerman at 4:21 minutes in round one and continue his quest to be Shooto’s next champion. Shooto is literally running out of opponents for Paling who has time and time again proven that he not only beats everyone in his path, he takes on all comers and is probably the most active fighter in his weight class. Paling will be watching the Noguiera/Abe fight very closely because he should be the next in line for the championship. Cooper wins by unanimous decision (29-28, 29-28, 29-28) over Buck after three rounds. This three round fight saw Ray Cooper trying to hold on to his top 5 ranking in Shooto while ducking no one and staying busy himself. Buck has been on a tear in the Midwest and making a huge name for himself culminating in the Ironheart Crown. Buck showed a good mix of stand up and ground while trading blows with the very patient Cooper throughout the fight. The first two round saw “Bradda” Cooper taking down Buck and punishing him in Ray “Bradda” Cooper style. Buck attempted a couple of triangles, but was unsuccessful. Round three was to be Buck’s round as he took down Ray after taking a hard shot standing that caused his eye to bleed. Cooper recovered guard, but Buck held his position well and rained down some blows in Cooper’s open guard. Unfortunately, it was a little too late and Ray Cooper continues in his quest for a Shooto title shot by winning a unanimous decision after three tough rounds. With Anderson Silva vacating the title, Ray Cooper’s name has to be mentioned when the Shooto committee plans the crowning of their next champion. The Shooto Hawaii show seemed to be blessed to avoid the production problems that normally plague beginning promotions. Maybe it’s from their strong religious beliefs and maybe due to a whole lot of planning and preparation. Everything went very smoothly and the Maui crowd seems very educated about MMA and enjoyed the action packed fights, including the technical ground work. Excellent sportsmanship by not only the fighters, but the crowd really made a good impression on the mainland based fighters. There is a place for mixed martial arts in Maui. There is no question about that. by arm bar at 3:19 minutes of 2 RD. by TKO at the 4:55 minutes of the 1 RD. Victor mounted punching down on Micelli. to tap before receiving undo punishment while Xavier had gained the mount setting to unload. by submission at the 3:15 minutes of the 1 RD. (Rear naked choke). by TKO at the 4:12 minutes of the 2 RD. After a very even 1st round action Cuellar gained the mount and began a barrage of strikes to the face of his opponent that merited the intervention of the referee stopping the actions. by submission at the 3:25 minutes of the 1 RD. (Rear naked choke). by KO at the 00:14 seconds of the 1 RD. Setting up with a front kick to Fernando’s midsection Akbarh followed up with a devastating left round house kick to Zatarain’s face that produced the quickest knock out to date in Reto Maximo. by arm bar submission at the 1:22 minutes of the 1RD. A game De la Torre couldn’t put out enough to beat one of Caique’s top BJJ brown belts. Steve Magdaleno Caique Brazilian Jiu-Jitsu, Los Angeles, CA. This was the card’s co-main event in a special rules match between two extraordinary BJJ representatives. Submission only – no points match up. Walter and Steven displayed their grappling expertise in a no gi fight that peaked twice. Steven first put Walter in a bit of trouble when spinning from the half guard into a knee bar that Walter managed to escape; Walter returned the favor by taking Steven’s back setting to apply a rear naked choke. Magdaleno defended Nakagawa’s intentions to put him in the oniric realm taking the 2 x 5 minute match to the limit for a draw. by submission at the 4:05 minutes of the 1 RD. The main event of the night pitted one of Mexico’s top judo champions, Figueroa, versus Farber, who has made a following for himself in Tijuana after two previous successful appearances. Hector controlled the actions first by getting inside Brodie’s stand up defense and throwing him with one of his trademark leg moves. What would have certainly ended the fight in a judo contest this time required a follow through; Hector assumed side control and was active landing knees and elbows to the body of his opponent. 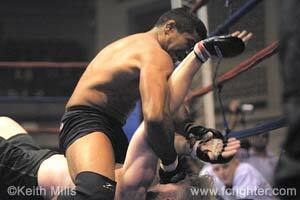 The first three minutes were on Hector’s side but his mistake came when shifting from side control to the mount. Brodie bridged himself out of the bottom position and both swiftly moved to stand up again. Hector shot in again on Brodie but this time he was caught by Farber in a standing guillotine that forced Figueroa to tap out. Lovely Uta (King of the Cage/The Price is Right) stepped on two occasion into the ring to throw out posters bearing her image as gifts to the appreciative yet respectful audience that were pleased to see such beauty gracing the event. Univision Television Network filmed the event to edit a report on MMA for “Primer Impacto”. The show should air soon. Maybe within 2 to 3 weeks. At attendance were many top celebrities of the fight world game including MMA, BJJ, Kick Boxing, and Boxing. A warm welcome to the MMA fan community!!! Thanks to each and everyone that supported our event including government authorities, sponsors, news media, production team, coaches, fighters, and last but not least. . . special thanks to all the fans! Pankracio – Reto Maximo III is coming February 9th, 2003.